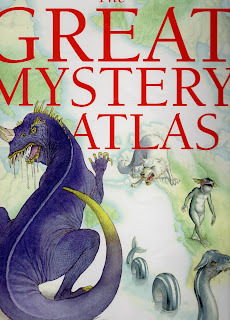 Back in July 2012, ShukerNature exclusively presented some excerpts from The Great Mystery Atlas - which is the only contracted, in-production book that I have ever been associated with that was never eventually published (albeit for reasons entirely unrelated to my involvement with it, I hasten to add! ), and which I therefore dubbed 'The Book That Got Away' (click here for further details). One of those excerpts contained an illustration by this book's artist, Stephen Player, of an unusual dog-like beast with scales, but whose name did not appear there, so I was later asked what animal it was. As it was such an unusual creature, I thought that this would make an interesting subject for a brief ShukerNature post of its own, and so here it is - with the original illustration of it opening this post. 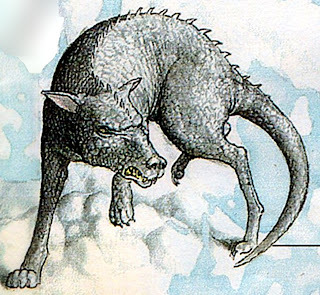 Appearing in traditional Inuit mythology, this remarkable if legendary entity is known as the aziwugum, and is indeed said to be superficially canine in form, resembling a great dog, but is covered in black fish-like scales rather than fur. Moreover, its long muscular tail is so powerful that it can allegedly kill a human with just a single blow from it. As far as I'm aware, there are no folktales of Inuits attempting to tame an aziwugum, but this is probably just as well - because if it became tame and friendly, and began wagging its tail, it could soon annihilate an entire Inuit settlement! Very interesting! I always wonder what inspires such legends. Relict therapsid? Haha, just kidding, of course. Probably some kind of mangy mammal. But maybe it does have some kind of connection to the relict Bear-Dog reports which exist nearby. Some of the other Alaskan tribes do have legends of bears that encrust themselves in ice. Kind of analogous to the Stone Coat legends among the Iroquois. This may be just another variation on that. Most children (or, at least, 'bookie' children) have books which are treasured and reread that will continue to inspire and influence them well into adulthood. 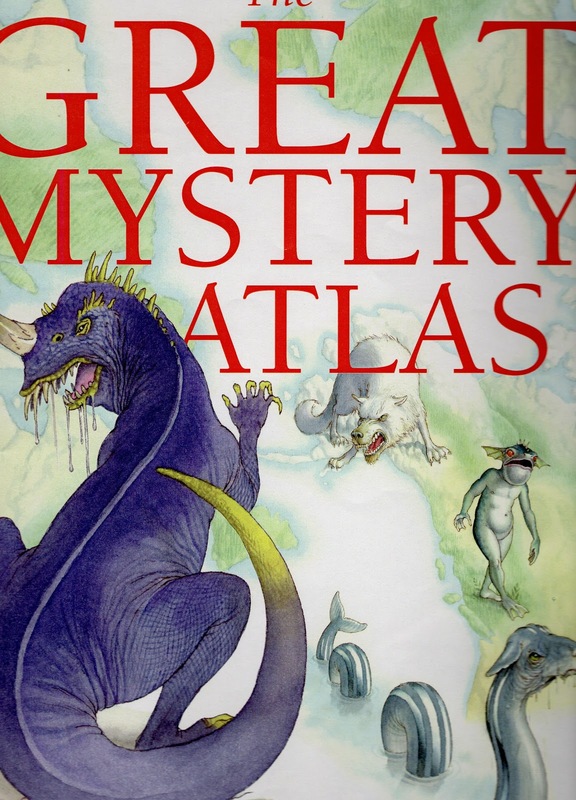 I'm sure a volume as fascinating and beautifully illustrated as The Great Mystery Atlas would have served such a purpose for many a child. What an unfortunate loss! Reminds me of a pangolin with an attitude. And teeth. Presumably Karl you're familiar with the variety said to have an insatiable appetite for coffee and donuts the clancywugum?